These gorgeous leather wide fitting sandals are the newest addition to the Summer Fruits by Coolers footwear collection. They have a leather upper and lining and a flexible outdoor sole which has good grips. They have two elasticated gusset straps to each side to ensure an easy and perfect fit. 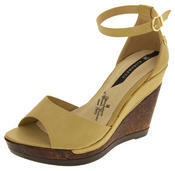 They are an EEE wide fitting shoe and come in 4 summery colours to suit any outfit. These look great, smart enough for work too, and appear to be well made and durable with plenty of width for my broad feet. However I am exchanging my size 6 for a 5 and would suggest ordering a size smaller if you are in between.